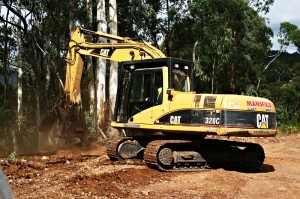 We Offer Tree And Stump Removal, Mulching And Forestry Work. We have been working on forestry projects for a number of years and our operators are very experienced working in alpine forest terrain – working on clearing forest and constructing fire breaks, building and maintaining unsealed roads , mulching scrub and overhanging trees on roadsides. If you have problem trees or stumps that need clearing from your property or need land cleared for construction, we are the guys for you. With years of experience and the right equipment we can make short work of even the toughest stumps. We also have mulching accessories on our excavators, which can be used to mulch down overgrowth on roads and driveways. Remember no job is too big and no terrain to tricky. If it can be done, we can do it. Give us a call on 0418 318 456.